Although more prominent features like Night Shift and a few new Quick Actions are getting the spotlight with the launch of iOS 9.3, one new lesser-known update is definitely worth checking out. 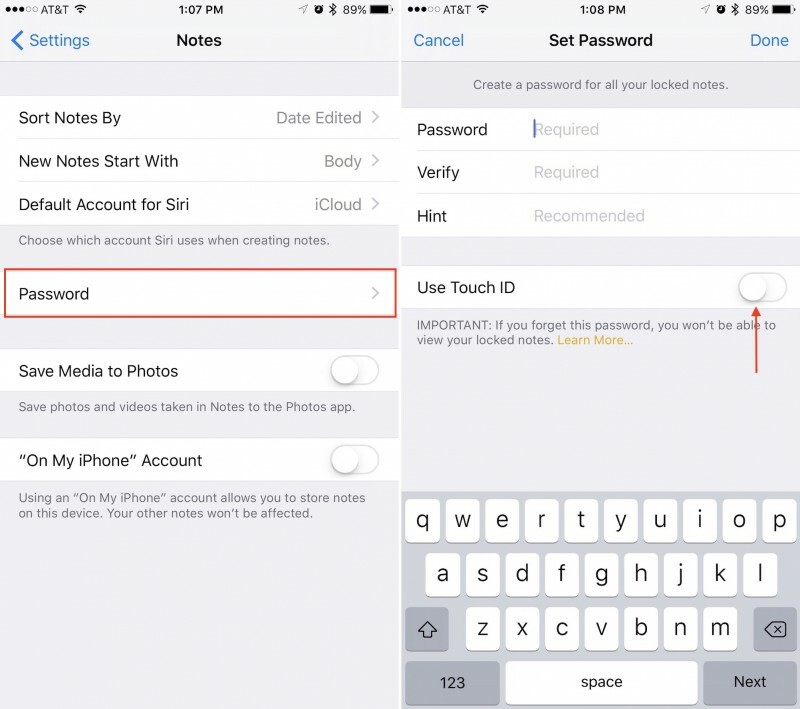 In iOS 9.3, Apple has improved the functionality of its first-party Notes app with the ability to add password or Touch ID security for individual notes. The feature allows users to prevent access to sensitive information on a case-by-case basis (some notes, like a shopping list, might not be as high risk), just in case someone gets past the lock screen security of the iPhone itself. With some people even using Notes to store passwords for various sites and services, Apple's security-enhanced update is well worth checking out. The steps needed to set up a password or Touch ID for your Notes are straight-forward and should only take a few moments to complete. Navigate to the Settings app on your iPhone or iPad. Scroll down to "Notes" and tap on it. Midway down the screen will be a "Password" option. Tap on it. If this is your first time setting it up, a menu will immediately appear asking to set up the new password. Fill out the fields requiring the Notes password (remember that something other than your iPhone passcode will be preferable), and then verify the password in the next field. Provide a hint to the password you entered to ensure that if you ever forget it you can be guided back through guessing. In the same menu, toggle on "Use Touch ID." Tap "Done" in the top right corner to confirm your selections. To test out the new password and Touch ID features of Notes, head over to the Notes app on your iPhone or iPad. There are just a few more steps to go through to fully protect a note of your choice from prying eyes. Once inside Notes, if you've already got a particular note in mind to protect, skip to the next step. Otherwise, tap on the bottom right of the app to create a new Note, and enter any private information you wish to hide. Inside the note, tap on the top right of the screen to bring up the share menu. Tap the "Lock Note" option in the bottom row. If you haven't entered the Notes password recently, the app will ask for the password or Touch ID fingerprint you created in the Settings menu. Comply by providing either measure of security. If no password or fingerprint is required, the lock will be added automatically. This adds a lock to the note, but doesn't actually lock it yet. To do that, click on the new unlocked button on the top right of the screen. The note should now be hidden with a simple "This note is locked" message. To view the locked note again, simply tap "View Note" and place your finger on the Home Button to use Touch ID, or enter your password. Alongside the iOS 9.3 update, Apple's OS X 10.11.4 introduces similar support for password-protected Notes for the company's desktop operating system. The password setup process carries over from the iOS installation, but you'll have to ensure that Notes are syncing with iCloud to properly use the password feature on a Mac. Scroll until you see "Notes" and make sure the box is checked. From here, any changes made to your Notes on iOS -- from their content to the locked/unlocked status -- should be reflected on the Mac. Of course, Apple's desktops and laptops don't have Touch ID, so if you want to unlock a Note away from your iPhone, you'll have to enter the password into the app. 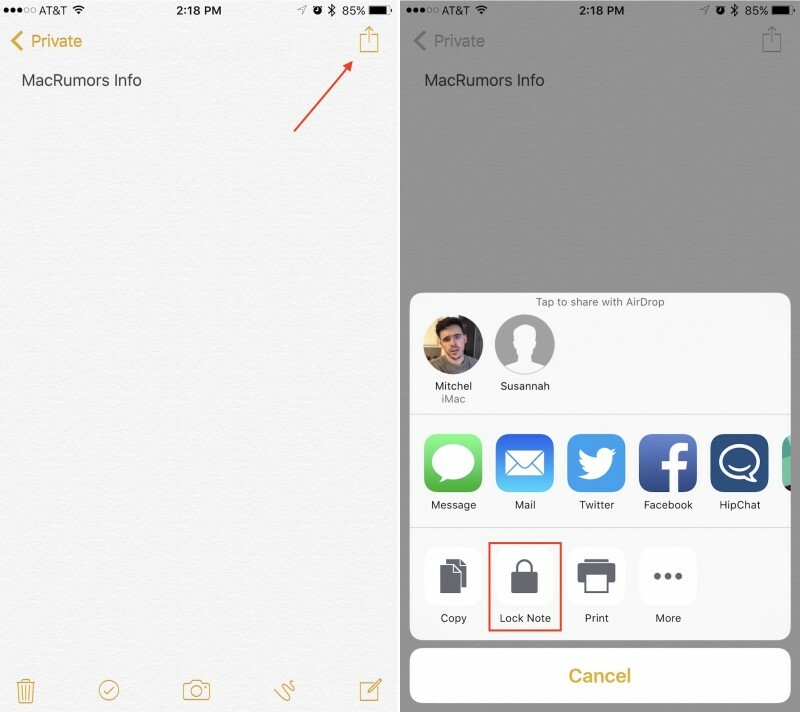 At any time you can change or turn off the password in Notes by revisiting the Settings iOS app, navigating back through the Notes, then Password submenus, and following either the "Change Password" or "Reset Password" buttons. There are plenty of other neat features that debuted in both iOS 9.3 and OS X 10.11.4, so check out MacRumors' recent coverage of each for more information. Leave it to Apple -- the company that lets you to put a disk in the garbage to eject it -- to have you click the Share button so you can lock a note for private use...the exact opposite of sharing. Kinda like clicking the Start button in Windows to shutdown. The interface for the lock is so odd. I always thought of the button on the top right as more of a "share" button. I looked for the lock almost everywhere except there because I thought it would be a ridiculous place for it. Hidden features is exactly the reason why Steve Jobs opposed a menu button Android-style. That Share button has become a complete joke, but it's only a symbol for the many other things that get hidden away, nested, convoluted, etc... All while at the same time not even increasing possibilities! Yes, I'm looking at you, iOS 7 and up on iPad... It's basically a blown up, "less nested options" version of the iPhone interface. Sounds like Android to me and hell, even there things have changed for the better. I wish the Notes app would automatically lock the notes as soon as you close the app, similar to how Credit Karma requires your Touch ID every time you close the app. Right now they seem to only lock automatically if you lock your phone, unless I'm missing something. If I unlock the notes and switch over to Safari, the notes remain unlocked unless I manually hit the lock button. Absolutely unintuitive. No casual user will even think about digging through settings for a new feature like that. And then to lock a note.. And then it stays unlocked until you lock it again. Touch ID is fast enough that it should always be locked. Agreed that the option is in a dumb spot - should be at bottom on the ribbon that has "add checkbox" icon, "add image" icon, etc. However, it does NOT stay unlocked until you lock it again. It just stays unlocked until you next shut off your screen; that way, if you pop out to check calendar or something, you don't have to keep unlocking it. That part is actually perfect & needs no work- just put the lock in a normal place! Notes Locking works only if the Note is on "My iPhone" or "iCloud". Does not allow to lock the notes that are stored in other email forms such as Yahoo, Google, Exchange, Hotmail and so many other. The other issue with Lock/Unlock feature is - when a Lock note is open it stays open forever and there is no time limit to auto-lock. This is feature of auto-lock is missing. Exactly. The same thing as in Safari when you need to click share button if you want to see website in desktop mode. An innovation of iOS 9. Yeah, no idea why not just make a lock button right next to the share button (just like how it shows up, after you lock it). Another dumb thing is how they make you click "view note" instead of just asking for a password or touch id. I never really understood why any app has authentication on the iPhone. You have to authenticate (touchID) once to open your phone right? Other than if you leave it unlocked and someone picks it up (who leaves it unlocked? ), why are we double unlocking? Not everyone locks their phone. It may work better for some to not lock their phone... especially if the only thing they want secure is their notes. In my case... I use my iPad at work & often share with coworkers. Thus, I do NOT lock it. Buuuuuut.... obviously, I don't want them to have (even inadvertent) access to my personal notes. This works well for me.